No flour, no problem! 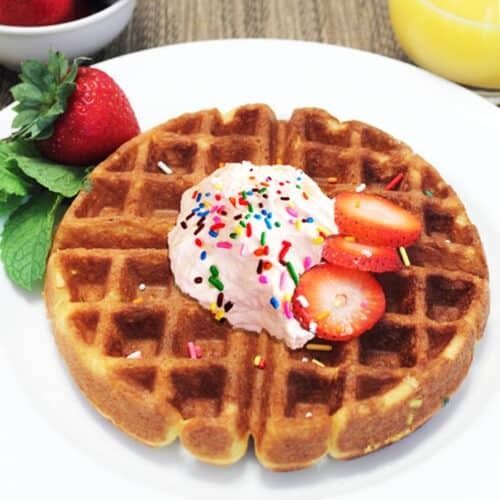 Whip up this sweet breakfast treat of cake mix waffles. It's so easy & the kids (big kids too) will love it! Pour cake mix into large bowl. Add egg yolks, milk, oil and chia seeds. Place egg whites in large bowl and whisk with electric mixer until soft peaks form. Fold into cake batter. Pour 3/4 to 1 cup batter onto hot waffle iron and cook according to manufacturer’s instructions, usually about 4 to 4-1/2 minutes. Remove waffle carefully, as it will be slightly soft, and place directly on oven rack to keep warm while cooking remaining waffles. They will crisp up some as they sit in the oven. Serve with fruit, syrup and, for a real treat, whipped cream.